The ankle joint is essentially a hinge joint with the ends of the tibia and fibula above and to the sides with the talus bone below. The joint (articular) surfaces are covered with perfectly smooth cartilage. This allows the bones to glide against one another with virtually no friction, allowing smooth movement of the foot upwards and downwards. Wear and tear arthritis (osteoarthritis) can occur spontaneously or as a result of injury. This can be one severe injury or repetitive sprains. It may also happen without previous injury. Ankle osteoarthritis is actually more common than most people think with signs being present in around 1 in 10 fifty-year olds. It is termed wear and tear arthritis because the normally perfectly smooth cartilage gradually wears and therefore becomes roughened. This prevents the normal smooth movement. There are other types of inflammatory arthritis (the most common being rheumatoid arthritis). These types of arthritis tend to affect many joints. The body’s own inflammatory system is responsible for damaging the cartilage, lining around joints as well as ligaments. This damage to cartilage produces the same affects as wear and tear arthritis. 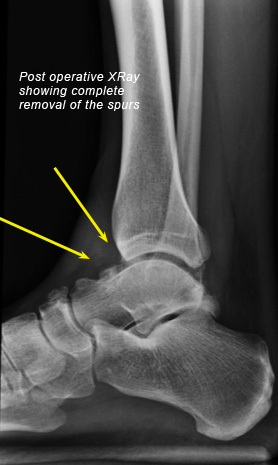 In the earliest stage of osteoarthritis a spur can be formed at the front of the ankle (footballers’ ankle). This produces painful upwards movement of the foot as well as a possible restriction in range of movement. In all types of arthritis, as the roughened cartilage does not allow smooth gliding of the joint, stiffness and pain start. This is typically first thing in the morning or after strenuous exercise or heavy effort. As the joint deteriorates, this happens with less and less activity up to the point where it is painful at rest or even at night. Swelling may also be present and this is certainly more common in inflammatory types of arthritis. 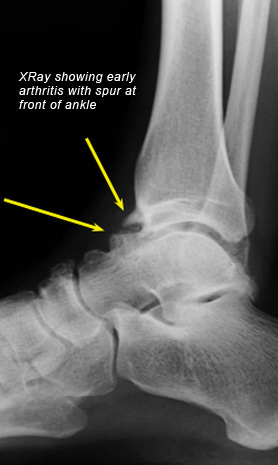 The ankle may give way due to pain and occasionally feel like it jams. The first stage of treatment is to take painkillers and anti-inflammatories (if possible). Occasionally bracing may be of some benefit, although usually only in the short term. If there is simply a spur at the front of the ankle, this can be removed providing excellent relief in most cases. Usually this is done via keyhole surgery (arthroscopy). Occasionally it is necessary to perform open surgery to obtain the best result. 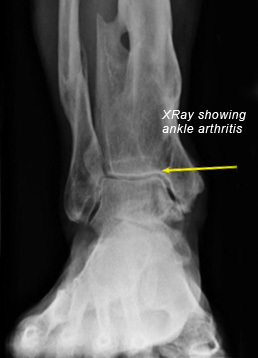 If the arthritis is advanced then there are two main operations: ankle fusion or replacement. 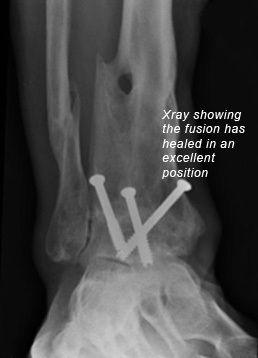 Ankle fusion involves removing the cartilage and a few millimetres of bone around the joint and using screws (plus possibly a thin strong plate) to hold the bones together until they become one. As the ankle joint has been removed the majority of the pain is relieved. Although the ankle itself does not move, the flexibility in other joints in the foot allows upwards and downwards movement of the foot. This normally allows patients to walk with an almost normal gait afterwards. The majority of patients can now have this performed through keyhole surgery. 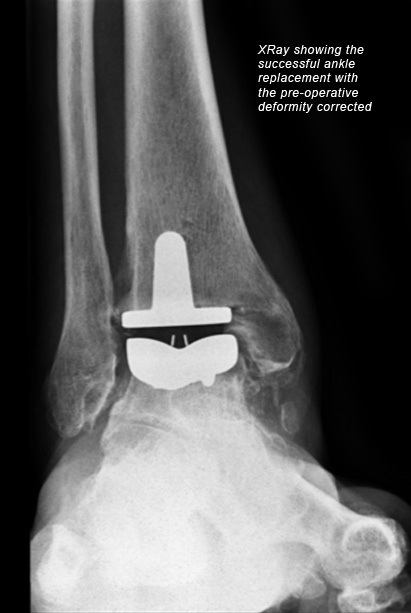 In an ankle replacement, the ankle joint is replaced with a new metal and high density specialised plastic one. This allows movement at the ankle joint whilst also relieving pain. The modern types of replacement have been around for up to 10 years although newer designs are being developed. The results at this point are very promising. There are differing risks and benefits for both these operations for each patient. These will be thoroughly discussed at your consultation so that you can decide on the best option for you. 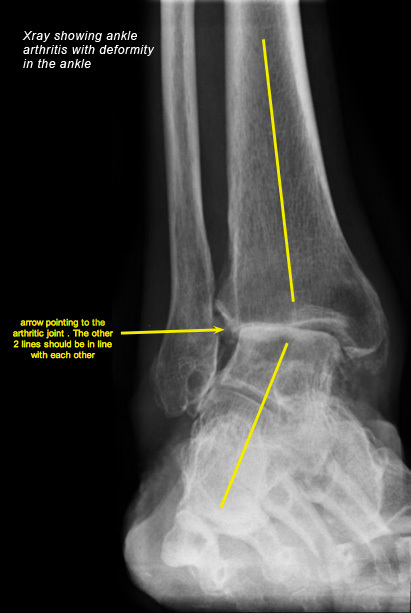 In some earlier stages of arthritis where there is some malalignment of the ankle, it may be possible to realign the ankle joint. This can offload the arthritic areas and improve symptoms whilst maintaining your own ankle joint. This has the obvious advantage of keeping your own ankle joint whilst aiming to improve your pain and function. This will be discussed fully at your consultation.